I plowed through big windchop for a true roughwater swim this morning. A visitor from Oahu wanted to swim at La Perouse, Malcolm couldn't make it until 9, so, what the heck, a few of us met and fought the waves. 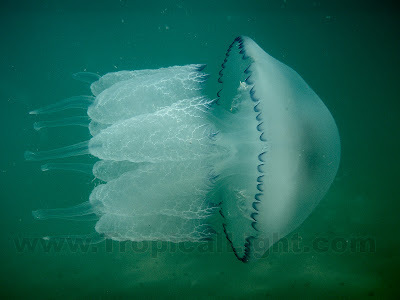 Which made me happy, I LOVE gnarly conditions. On the way out I found a Giant Triton and showed it to everyone. 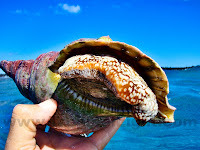 These guys love eating starfish, especially the Crown of Thorns starfish which had been destroying the La Perouse reefs a couple of years ago. At the time I was panicking and worried that there would be no reef left. Not to worry, nature took its course and everything turned out great. The La Perouse preserve is scheduled to be closed to the public beginning tomorrow, so today was a great day for a swim to the "Aquarium." 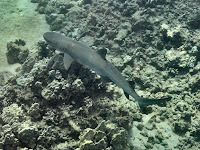 As usual it was nice and calm inside and there were the usual schools of fish. The swim back was daunting, but FUN. 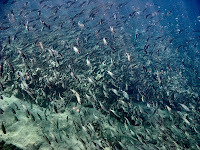 I ran into a big school of Akule (Big Eye Scad) while out swimming this morning. 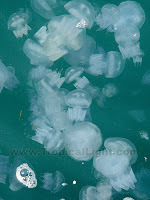 They were tightly clustered into a ball (no impersonations like in Finding Nemo) so I looked around for predators. 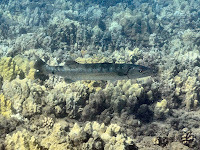 Sure enough I suddenly found myself way too close to a BIG Barracuda (why are they never as scary in the photos?) who did not run away. So I backed off a little then attempted some photos. On my way back to the beach I met a little girl about five years old floating on a boogie board out in deep water. She said her father was scuba diving down below and proceeded to tell me about the Eagle Ray and Turtles she had just seen. A big turtle surfaced near her and she matter-of-factly petted it while talking to me. 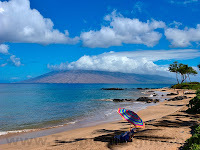 Sometimes Maui beaches feel crowded, but my trip to the Black Sea has put that into perspective. Even though no sand was to be found, only pebbles and rocks, beaches over there were packed solid with people. Towel adjutted towel and beach goers came and went by walking over each other. Here we are blessed with soft sand and long stretches of nearly deserted beach. On the other hand, here I sense a certain degree of loneliness which wasn't evident over there. 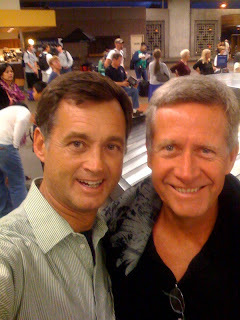 Doug and I have withdrawn once again into the isolation of our television set in the evenings. I miss promenading up and down the streets in the evening with everyone else in town. It was Great to be back splashing around in the warm Pacific Ocean this morning. Boy the water is salty! 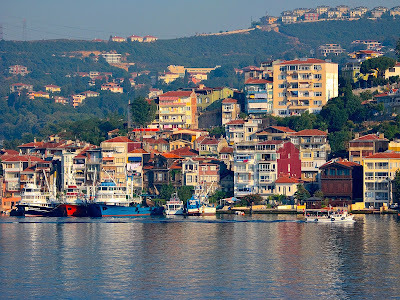 While the Black Sea is salt water, the salinity is far less than other oceans. By the time I finished my swim my mouth was pickled by the brine. 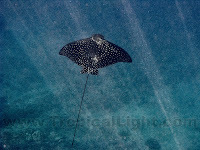 I got lucky and saw a Spotted Eagle Ray, and even caught Bruce out for a stroll. Both seemed to be in a hurry to get somewhere, so I only managed quick snapshots today. What a treat! 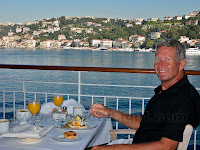 I woke up this morning to the sight of the Bosphorus sliding by my window. The early morning sun was perfect and Doug and I ate our final breakfast on our lanai. We thoroughly enjoyed the spectacular finale to our time aboard The World. 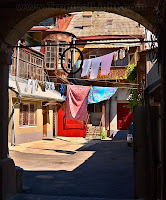 Today was a day of relaxation, just casually wandering the streets of old and new Nessebar. On previous trips into town, I fought valiantly to capture photographs of Nessebar's monuments in as pristine a state as possible. Today I decided to take some of the town as it really is - with souvenir stands obscuring much of even the most important monuments such as the church in the center of this image. Our big adventure was crawling around an active archaeological dig and talking with the workers - until we got chased out, that is. 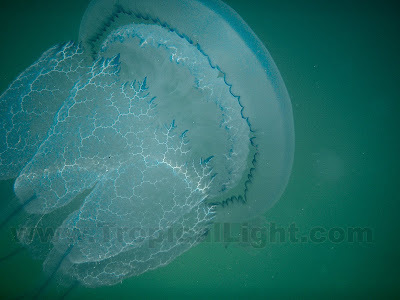 I got to swim today with countless numbers of jellyfish. I attempted to swim for exercise, but I kept stopping to watch these fascinating creatures. Besides, it was kind of weird each time I would run into one, which was about every five seconds. 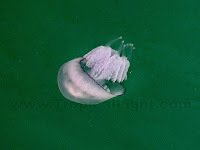 It was sort of like encountering floating sheets of cellophane, only alive. So instead of swimming I focused on taking photographs and video of them. Hundreds of photographs and lots of video (Click HERE or Below for the Video). For the most part they were benign, but I ended up getting quite a few stings all over my body. A few still hurt, five hours later. 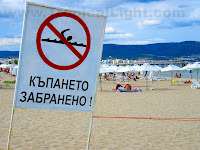 I'm not sure what this sign said, I can't read Bulgarian. It was probably something like "Don't Wave When The Water Is Choppy." Anyway, I had fun swimming today. 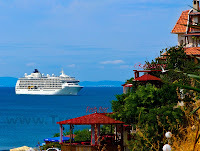 We are at anchor off the old town of Nessebar in Bulgaria. 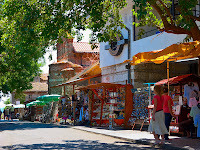 Nessebar was named a World Heritage Site by UNESCO, but it really should have been named a World Souvenir Shop Site. I don't mind all the restaurants and bars, but pretty much every inch of exterior wall space is taken up with displays of trinkets. This former island is known for its preponderance of churches dating from the 5th century until the 18th century. And all in ruins. 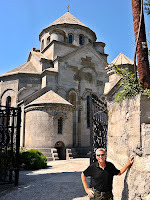 There are something like forty churches in this tiny town, and only two or three of them have been rebuilt with roofs. And absolutely none of them are in use as a church. It is quite a contrast to Ukraine and Russia where churches are extremely important and highly revered institutions. Even the ruined ones. 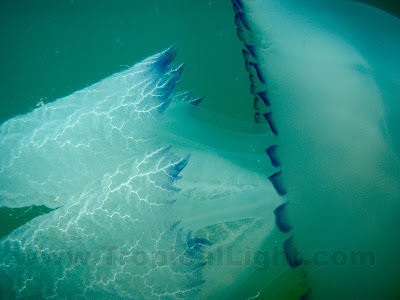 But more important (to me) than old piles of rocks and bricks are the big jellyfish we see all around. I took this photo from on the pier and am really looking forward to getting in with them either tomorrow or the next day. Doug and I participated in a Wii tennis tournament during our full day at sea today. Wii is the video game which uses your arm motions to move the characters on screen. So this was a real tennis tournament - without all that bothersome running and sweating (Shhh, don't tell him but Doug WILL be getting one for his birthday). Everyone who entered was in their teens or less; and then there were these two old fogies, Doug and Don. And the winner was... a five year old boy. No, not Doug. We wandered through the streets of Odessa today, determined to spend the little Ukrainian cash we had before leaving the country tonight. Doug and I are the worst shoppers. Casually strolling in and out of stores seems to be beyond us. Give me a shopping list and I will go in, get what's needed, and leave. I was, however, able to wander aimlessly in and out of various courtyards. I guess the main fascination for me is that they are mostly off-limits; and I want what I can't have. One of the nicer shopping courtyards (not even remotely kapu) was roofed over making it into a mall. 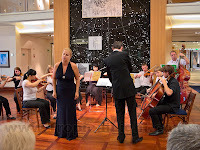 This evening as the ship was about to depart, the Odessa Chamber Orchestra gave an hour performance in the lobby. I hadn't realized from the previous entertainment how great the acoustics are in that space. A soloist from the Odessa Opera Company also did a few numbers. The music has additional impact when you are only a few feet from the performers. Wow! Our fascination with hidden courtyards continued today. 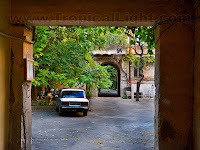 As we strolled the streets, we stopped to peek into many of them. They are kind of like little rural villages in the midst of the big city. Trees and grape vines are common along with hanging laundry and parked cars. Some even had courtyards within the courtyards. All very mysterious and enticing. Some courtyards have businesses and restaurants. 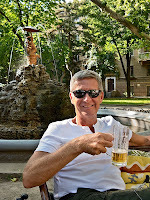 Doug and I enjoyed beverages sitting next to a fountain in big comfortable seats in the courtyard behind the Opera house. A series of young unmarried couples came and sat in one of the park benches facing the fountain. At one point there were three couples squeezed onto this same park bench, each couple managing to ignore the other two couples. In Sevastopol the most common street vendor was the karaoke booth. In Yalta it was the dress-up booth. 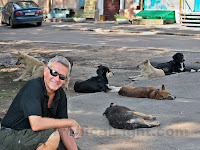 Here in Odessa it is posing with live animals. 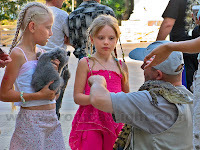 You can hold a rabbit, chinchilla, or crocodile like these girls. We've seen lots of monkeys and one lion cub, or there are larger animals like boa constrictors, eagles and falcons. Or you can sit on a pony or horse. Personally, I prefer posing with dolphins. We visited the in-town market this morning - and it was huge. Block after block of everything conceivable for sale, mostly from small booths. We read that there is an even larger one just outside of town which generates sales of over 20 million us dollars per day. 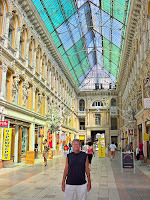 I was feeling overwhelmed by how much was at this market, I'm glad we didn't visit the larger one. In addition to well-behaved children here in the former soviet bloc, we've noticed very well-behaved dogs as well. They tend to gather in groups and all flop down together. The one fight we saw between two dogs was absolutely silent - nary a bark nor a growl. We passed numerous huge Russian Orthodox churches today, but the interiors were all locked. There did seem to be perpetual services being held in the basements of all of the churches. No matter when we entered there was a service of some kind in process, and always with chanting and incense burning. 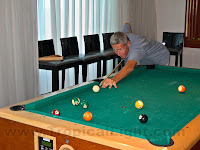 What is a day at sea without a few games on the self-leveling pool table? Doug absolutely destroyed me - which was only fair after I massacred him at table tennis last night. 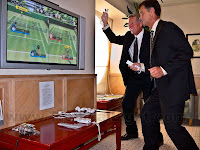 We have also been having fun playing tennis on the ship's Wii game console. Via a video game is the only way I can be even remotely competitive with Doug at tennis. We have an entirely different view while at dock here. Previously we looked out to sea or in toward a distant town; this time we face the port building and there is a walkway which passes right by our windows. It is entertaining watching all the people strolling by, and we can always close our curtains for privacy. Odessa is by far the most cosmopolitan port we've visited. It has a feel somewhere between Paris and Vienna. Downtown is a short left off the gangplank and up the stairs. 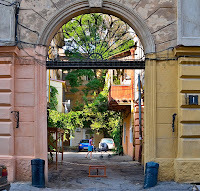 Many of the buildings in this part of town are built around common courtyards which give the residents privacy and a quiet respite from street noise. The streets are stone. Some are cobblestone. We watched these guys repaving one street with beautiful granite bricks, lots of sand, and rubber mallets. Two crews were quickly working both ways down the street from the center and they were creating patterns in the stone as they went. 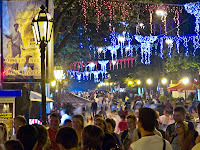 One of our favorite things in the Black Sea has been the public's evening promenade, and Odessa did not disappoint. Thousands of people, families, friends, couples, singles and dogs were parading up and down the streets and parks. The U.S. is really missing out on something special. Of everything we will miss when we return, the evening outing will be number one. 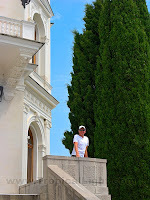 The people of Yalta made me feel like a celebrity. 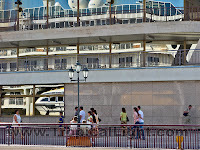 There was always a crowd gathered around the gangway to watch me each time I got on or off the ship. 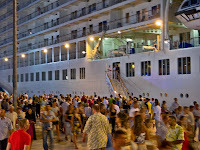 The biggest crowds were in the evenings and there was an especially large crowd gathered to see us off tonight. When the last line was cast off, people rushed to the side of the ship cheering and waving as we pulled away. Yesterday at Livadia Palace we noticed the outline of a swallow carved into a rock along one of the many trails we passed. 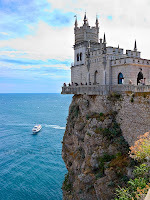 We assumed that following that path would lead us to one of the Black Sea's more famous landmarks, the Swallow's Nest. This morning Doug and I borrowed a couple of the ship's mountain bikes and set out in that direction. Or so we thought. We followed the twisting road out of town, up hills and down hills, and around until we suddenly found ourselves back at the ship. The second time we tried different roads until I noticed that we were passing the same soccer field as before going the same direction as before. Finally on our third try we actually got out of Yalta. 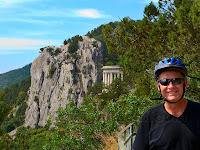 After some very steep hills we even made it back to Livadia Palace and found the swallow sign. The little foot trail was delightful. It led through shady woods alive with the noise of cicadas and babbling brooks. It also clung to the edge of some high cliffs with great views of the coast in both directions. 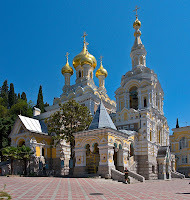 As we passed below a gold domed Russian Orthodox church we could hear a choir practicing. Magical. Then a miracle happened. I actually asked someone for directions! Yes, it is true. And she sent us back the way we had come, but down toward the ocean. It was great riding the bikes down, down, down and there it was. Much smaller than I had expected. Tiny, in fact, and Disneyesque. Still, it was pretty cool perched on the edge of a high cliff. Doug and I had a nice lunch at the restaurant inside and even splurged on the caviar appetizer. We had more steep climbs on the way back and now I'm going up to the hot tub for a nice long soak. In my previous post I suggested that the younger women like to dress up. Well, it turns out that women of all ages like to dress up here. 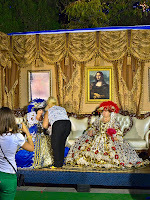 In Sevastopol we noticed that the most popular vendor along the evening promenade route was the Kakaoke booth. Here in Yalta it is the dress-up booth. Each vendor has rack upon rack of fancy dresses and a small set upon which to pose. Sitting rooms and royal thrones are the most popular sets. One throne even had a live peacock which would spread its tail feathers on cue. A lot of care and attention goes into choosing the outfit and then into being properly arranged and made-up. Finally, once everything is perfect, the photograph is taken. There are even sets for the guys. At least two locations featured eight tricked-out motorcycles and racks of leather jackets. As usual, I was too shy to give it a try. The young women of Ukraine and Russia wear short skirts and high heel shoes to the beach. Sometimes very high heels. 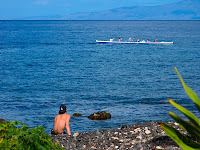 It is kind of sad watching them stumble across the pebbly shore; but on the promenade to the beach, they look hot. Janet and Patti, are you going to give it a try and set a fashion trend for Maui? Doug and I wandered along the shore this morning and got lost a couple of times. 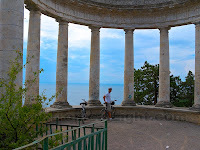 Fortunately Yalta is like Maui, there are two directions: uphill away from the water or downhill toward the water. Since our base of operations is afloat, the choice was always an easy one. We did stumble across the Livadia Palace which is where Churchill, Stalin and FDR divided up Europe after WWII. It had earlier been the summer home of multiple Tsars. This palace, like so many other late-period European palaces, struck me as resembling an old U.S. high school. Or maybe I've had it backwards all these years and U.S. high schools were built to look like European palaces. 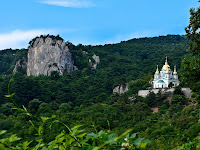 It seems the prime sightseeing attractions in Yalta are Russian Orthodox churches and the villas of the pre-revolutionary rich and famous. We wandered aimlessly and found two different outdoor markets and two fancy churches. 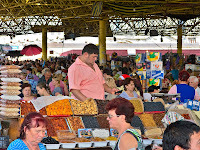 People bring anything and everything to the markets to sell. Many display their wares on blankets on the sidewalk, many in booths lining narrow alleyways. I couldn't figure out how to photograph the booths because they line paths which are so constricted that two people have to squeeze to pass each other, and they twist and turn. The older church, made of massive blocks of stone, had an austere exterior. The inside, in contrast, was brightly lit and aglow with color. 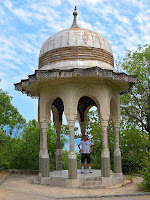 We found it up on a hill and definitely off the beaten path, so it was completely deserted. Doug even climbed the tiny stone steps up to the steeple, at least until he ran into construction materials and couldn't go any further. The newer church was all bright and shiny outside, but dark and most serious inside. There were lots of beggars at the gate, and the interior saw the comings and goings of many old men and women who were busy lighting candles around each of the icons. The beaches were packed - no surprise since this is primarily a resort destination. What was different was that when we arrived at 7:30 in the morning, the beaches were already full. I'm assuming there isn't much nightlife here.